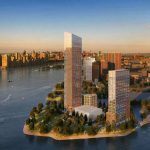 New renderings were released this week of the one million square foot development coming to the Long Island City’s Hunter’s Point South neighborhood. Designed by Handel Architects, the complex features two high-rise towers, retail, and community space. Notably, the project is expected to bring 1,100 new residential units, with 80 percent of them permanently affordable. 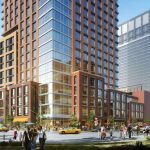 The complex sits less than a mile from the planned office complex of Amazon, which chose the Queens neighborhood last month for its new home. 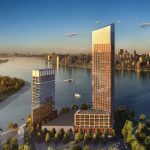 As CityRealty reported, the two towers will rise 57 and 33 floors, with the taller of the two reaching 600 feet high, which would make it the tallest building on the waterfront. As 6sqft learned last November, the city selected Gotham and RiseBoro Community Partnership to develop the $500 million project, which will be built at the intersection of 57th Avenue and Second Street. 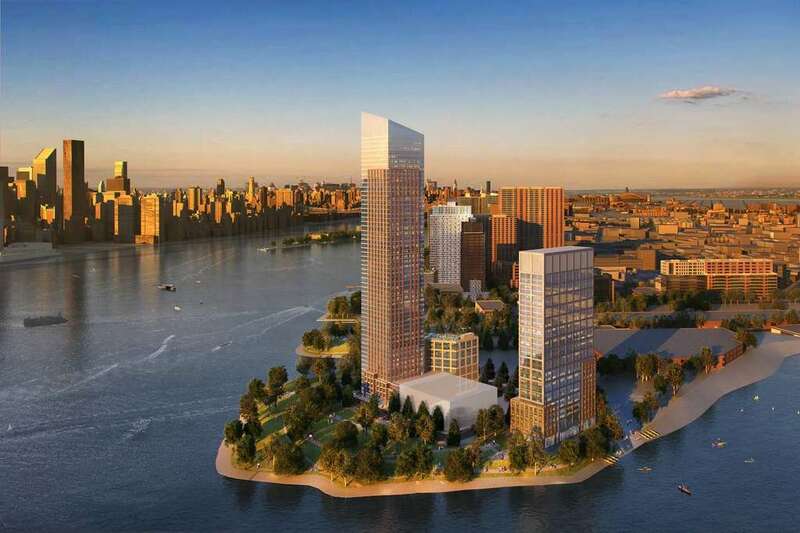 The project is part of the city’s larger plan to redevelop Hunters Point South, first conceived by former Mayor Michael Bloomberg. In total, the master plan includes nine parcels of land across 30 acres, with the goal of bringing 5,000 apartments and making 60 percent of them affordable. 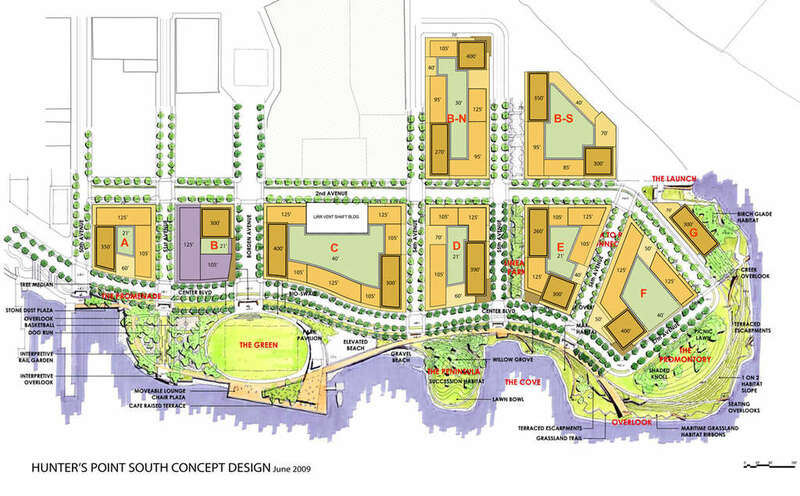 The plan also included creating new green space; the second phase of Hunter’s Point South Park officially opened this summer, measuring 11-acres from 50th Avenue to Newton Creek on the East River. 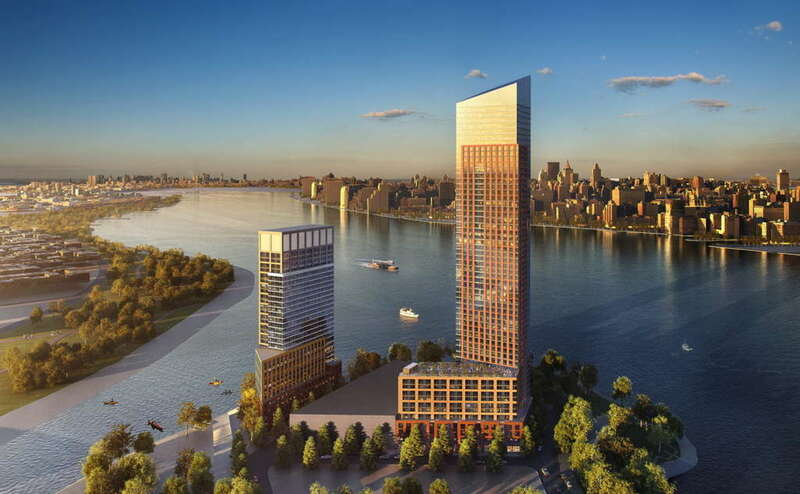 According to the architects, the shape of the buildings relates to the variety of the structures built along the Queens waterfront. The glass corner of the 57-story tower sits back from the street, with this tower’s upper base broken apart by the glass reveals. The varying heights along the sides are meant to create a sense of rhythm. Plus, three varying colors of red brick were used to define its volume. The smaller tower will feature a mix of red brick, with glass reveals throughout. The tower’s dark brick and metal panels “defines the building architecturally,” according to the firm. The development is happening on Parcels F and G.
A design and development team consisting of SHoP Architects, Phipps Houses, Related Companies, Monadnock Construction, and Ismael Leyva Architects designed two towers, with 925 affordable units, at Parcel A and B, completed during phase one of the project. 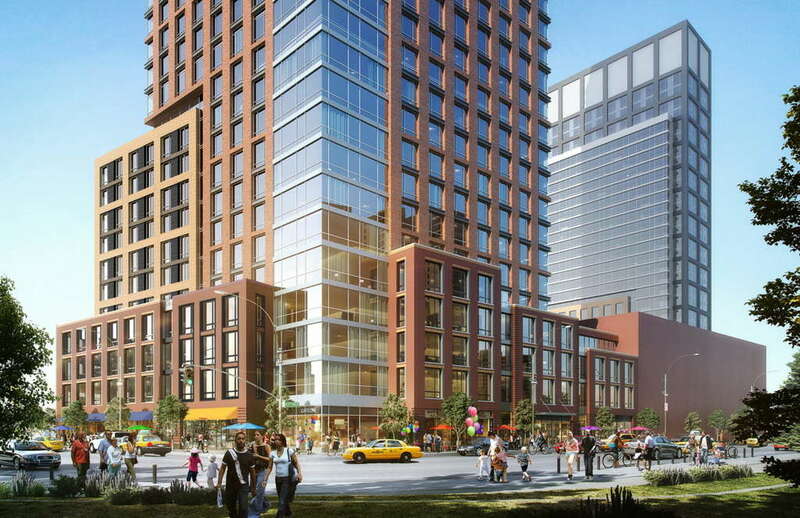 Other projects proposed for the site included TF Cornerstone’s pair of towers with 1,000 apartments, and 250 of them affordable, at Parcel C. But with Amazon moving to the neighborhood, who has said the company has no plans to build housing at its new complex, this plan to build affordable housing remains up in the air. Plus, the site of Amazon’s new home contains private property that is owned by plastics company Plaxall. Before Amazon’s announcement, Plaxall had plans to build a mixed-use complex that called for 1,250 units of affordable housing. And while a few acres owned by Plaxall will not be used by Amazon and could potentially still be developed residentially, the number of affordable apartments will be nowhere close to the 1,250 first proposed. “The fact that massive public subsidies are helping eliminate affordable housing is just the latest reason this bad deal needs to be torn up and thrown away,” State Sen. Michael Gianaris, a vocal opponent of the Amazon deal, told Politico last month.